6.50 points at 12 votes (rank 504). 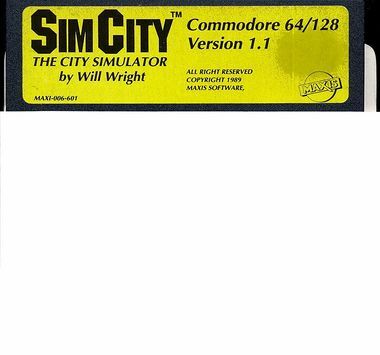 The economic simulation Sim City was programmed by Will Wright on a C64 in 1986. 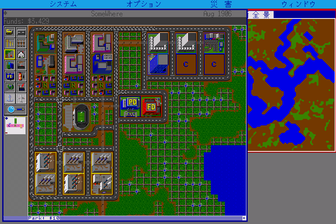 In Sim City, you design, create and manage your own city. The Commodore 64 port was the original version of the game and was released later in 1989. 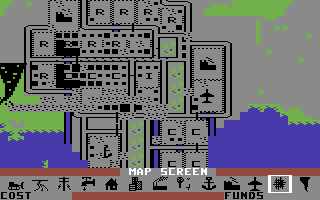 Unfortunately, many interesting features and possibilites in other Sim City conversions were missing in the C64 version of the game, e.g. disasters and budgets. 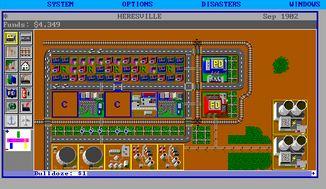 In return this version already included a water system for the city, that became a standard only in the later sequel Sim City 2000.
location and building of commerce and industry, shopping centres, parks, harbours, airports or stadiums so that the village or small town grows to a metropolis, if the player wants that. During this you need to keep all town factors in balance in each round (see reference map), so you will not run out of money from the city treasury, the population will not die out or move to the neighbouring city and suddenly turn yours into a ghost town. If you find the building of your own city of dreams too time consuming, you can enter the game with the already provided and built cosmopolitan cities that correspond to the real cities of that time: Tokyo, San Fransisco, Bern, Hamburg, Rio de Janeiro, Detroit or Boston. These towns are also used for simulating the corresponding scenarios with the respective catastrophes and events, e.g. earthquake in Tokyo or a bomb attack (simulation of WWII) in Hamburg. It was and is interesting to be able to trigger some environmental influcences when getting bored, as eg. tornados, earthquakes, blazes, disasters with means of transports etc. Rather exciting is also the activation of destructive characters from earlier horror movies, as e.g. Godzilla (here only as a monster). Equally interesting were the mini-simulations that were already contained at that time, as e.g. a simulated flow of the traffic which started automatically and was shown when the area at this street was well colonised. Other means of transport enter the game as animations when certain buildings are made: planes after building the airport or ships when a harbour is there. 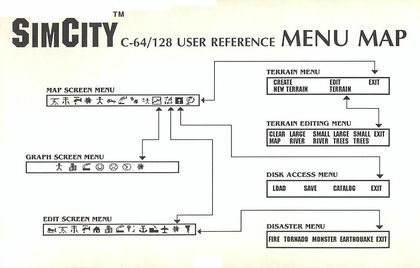 Also the controls of the menu items via icons were relatively new at that time. Sim City is a city building game which unites an economic simulation with a real-time strategy game. It is controlled from a two-dimensional birds view with the joystick and an interlaced menu that is in the lower screen bar. Unfortunately, there is no support for the mouse which would be very well suited for this game. However, you can of course use the mouse in the joystick mode. Graphically, the game does not raise the bar on the C64. It works with a modified charset and a few sprites e.g. for the joystick cursor, airplanes, tornados or the monster. The sound of the game even received slating reviews by the specialised press - except for the sound when opening up or closing the Edit Screen Menu the C64 version is a very soundless game. In return the game runs mostly fluent, the loading times keep within a limit and it all fits on one disk side. The game was protected by a software copy protection. The disk ID of the data disk must be C1 or otherwise the game will not recognize the disk! It is advised that you use only the separate data disk for saving the game data! The savegames are saved as sequential file with "NAMEOFSAVGAME.C" with a maximum um 13 selectable characters, consisting only of letters and numbers, whereby numbers in the disk's directory are saved as graphics characters or special signs. 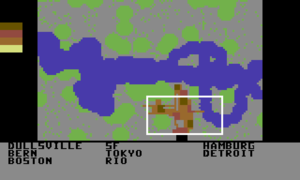 A Sim City savegame of the C64 version has always the size of 41 Blocks. At the start of the game a random landscape to be colonised is created and you always start with 4000$ capital. The seed capital is shown at the lower right side (below the icons) as Funds in the Edit Screen Menu. 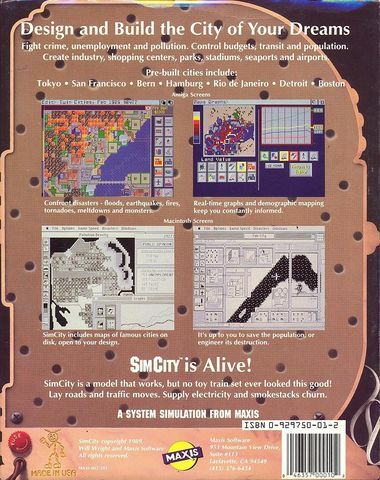 You play Sim City with a joystick in port 2. By the joystick yu can either scroll through the current landscape or build or tear down buildings, shops, streets, pipes etc. in the edit mode. The icons or respectively menu options can be selected by the cursor keys (alternatively with the keys Y and X ) for moving left or right. The Disk Access Menu and other menus are opened or closed with the key RETURN or left by the menu point EXIT. A menu option can be cancelled by using the "left arrow key" (similar to the <ESC> key on a PC). How high is your Traffic Density on the map? 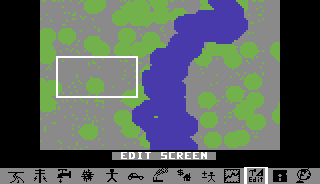 After starting the game a random terrain appears on the screen and you see the Map Screen Menu. Disk Access Menu - For loading and saving of your town or score. About the Overview maps: These show your streets, power lines, water ways, etc. of your city in miniature on the terrain map. About the Index: Yellow is a low density, followed by orange and red until brown for the highest density (most of the time not good). The density indexes are also showns as a miniature view as overlay over your city area in the terrain map. 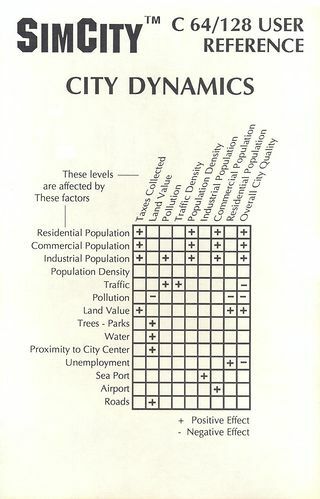 The Graph Menu show the trend of the important city factors and tell you how attractive your city of dreams is. Standard of Living - this should increase or be very high. The colonization starts: In this town there is already a lot going on! The moving dots (which are of course the Sims, the citizens) show this to you. Bulldozer 1$: Plane the city terrain, before build-up a building: Lumbering trees, straightening rivers, fighting fires, removing ruined or misplaced buildings or pipes. Roads 4$: Building of roads is very important for the transport of the population and food. Curves, crossroads and junctions are automatically created when another piece of a street is connected. Streets can be built linearly also over brooks and rivers as bridges. Power Lines 2$: This is always needed to connect power from the power plant to houses, shows or the industy. They can only be laid in a right angle and cross staight streets or brooks. If you build a building next to the power station or a new building next to a building supplied with power, you do not necessarily need power lines. Water (of course a nice city river or a canal) 2$: To connect the drinking water to buildings and to embellish the landscape, raise the value of property and raise the quality of life for the citizens. Canals can also be built rectroactively below streets and power lines. Commercial Zone 100$: Allocate an area for building shops for daily needs. Industrial Zone 100$: Allocate an area for building industries that supply your citizens withr daily work. Park 50$: For relaxing for the workers and citizens. Sea Port 1000$: To ship goods in transit - important for metropolis. Power Plant 2000$: Important for the electric power supply of your town. Don't forget to build a reserve power plant,to avoid being without power in case of sudden natuarl disaster! Back to the Map Screen Menu. Change to the Disaster Menu. Note: Allocated areas for buildings can only function fully in the town when the "green P" (for powerless) is not flashing any more, i.e. when they are connected to the power lines. If the upper mentioned areas become deserted because they have been without power for too long, they often need to be torn down again! The Sims autonomously build houses, shops, churches or factories in the allocated areas. The darker an allocated area is, the more intensively it gets developed and used. Simulated natural disasters: A hellfire, a tornado and a monster together. Can it get worse? Fire - Choose the area with the crossline where you want to ignite a fire and activate it (this does not work in the water!). Fires can also be saved and jump from builings, trees or woods to other buildings. The flames do not cross natural free areas, roads and waterways. To actively fight the fires you need to use the bulldozer. 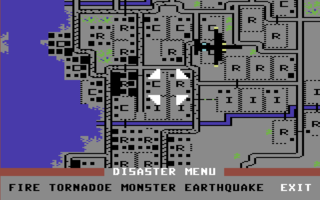 Tornado - Once activated, the tornado stays active until it leaves the screen or Sim City is started anew after a reset. 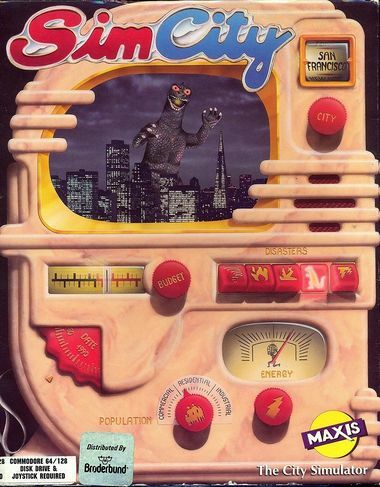 Monster (like Godzilla) - Once activated, it stays alive until Sim City is started anew after a reset. Exit - Back to Edit Screen Menu. Note: After causing one or several disasters you can rebuild your town. The supplied scenarios in the Disk Access Menu. LOAD - load your last score or saved town. SAVE - saventhe active game, town or score to the disk. The file name (until 13 chars long) can contain only numbers and letters. If an already used name is given, the old scare will be overwritten! CATALOG - to display the saved scores or towns from your data disk. Note: If you give a file name that is too long (longer than 10 chars), Sim City is crashes though the use of this disk function! EXIT - Back to Map Screen Menu. Create New Terrain - A new, randomize terrain is created (takes some time!). The currently played town is destroyed! Edit Terrain - Open the Edit Terrain Menu. Want a new terain? The 'Edit Terrain Menu for creating a new terrain. Clear Map - All the visible terrain is deleted (takes time). Large River - Broadening of the river. You can add water elements in the displayed area by using the joystick. Small River - Diminish the river. Large Trees - More trees or woods. You can add tree elements in the displayed area by using the joystick. Exit - Back to Terrain Menu. Note: Rivers can be put on trees and terrain, but no trees can be placed into rivers! If a terrain with buildings is edited, the existing buildings could get destroyed! 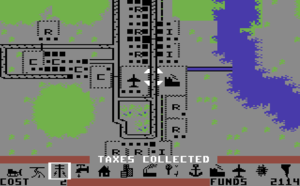 TAXES COLLECTED: A year is over in Sim City and the taxes go into the town fund. Now you can edit or build more things. NOT ENOUGH FUNDS: You haven't enough money to edit or build elements. You can wait a Sim City year or build cheaper buildings. THAT AREA IS OCCUPIED: Something is in the way when building elements, e.g. a tree, ruin, road, pipe, brook, uneven river bank, etc. Only the use of a bulldozer can help here. After that the message should not appear any more and the building should be possible. DULLSVILLE, USA 1900 (Boring): Manage the smallville DULLSVILLE to grow it to a metropolis by planning the city anew, so the citizens are not bored any more. SAN FRANCISCO, USA ca. 1906 (earthquake with magnitude 8): After loading the earthquake function is called up. After the earthquake first stop the fires and then start the rebuilding of the city. HAMBURG, Germany 1944 (mass fire): After loading, place 12 fires in different city parts of Hamburg. Wait for about 2 minutes (simulation of an aircraft bomb attack in WWII) and then try to stop the fires and rebuild the town. BERN, Swiss 1965 (traffic jam): Replan the roads and buildings to remove the traffic jam. TOKYO, Japan 1957 (monster): After loading, activate the monster and chase it. Then first re-establish the power supply and finally rebuild the destroyed buildings. DETROIT, USA 1972 (commercial crisis): Reallocate the industrial areas to create more work for the population. BOSTON, USA 2010 (tornado): After loading activate a tornado and wait until the tornado is gone. Then rebuild the town. RIO DE JANEIRO, Brazil 2047 (changing times): Restore the balance between trade and industry and the population. Tear down wrongly placed buildings and build something new. This is how the game designers imagined Hamburg in 1944. After the mass fire in a part of the city of Hamburg: to the left are ruins and to the right powerless areas. Push the function key F1 to set your funds to 4000$. With this the starting capital can not only be raised, but also lowered! Choose the edit/build function in the Edit Screen Menu. Check if you have enough money for this building. Check if you have enough plane place for this building. If not, plane or remove the disturbing elements as trees, ruins, roads, etc. or straigthen rivers. The building is set by pushing the fire button on your joystick. Now connect a power line from the power plant to the builoding. This is not necessary if the building is next to an existing building with power supply! Finally, lead a road to the building, so the population (the Sims) can use it. First build a power plant. After that allocate some areas for private homes, commercial shops and industries. Connect the allocated areas to the power supply. Then build roads, waterways and parks and also lead the to the allocated areas. If required, expand your town with these city elements. Choose the right mixture! Think about oncoming disasters; if you have many areas and buildings it makes sense to build reserve power plants. When your population grows and your town earns enough taxes you can build bigger things as harbours or airports to expand the town to a metropolis. Sometimes a "black square" appears below the factory icon between the "cost per item" and the funds. This shows that the power supply of the town is tested. The bigger the town is and the more buildings need to be supplied, the longer will these tests last. If the "black square" is there for too long, there is a power outage by overload of the power plant. Then further power plants should be built in other parts of the town to ensure a stable power supply. As the game has no ending, there is no solution as such. Either you go bankrupt sooner or later due to too many disasters and all you have left is a heap of ruins, or you go on playing into eternity. You can try new tactics in each game and experiment at will. But there are always a few thing to keep an eye on. 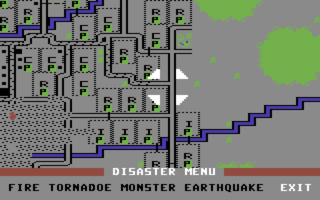 What works for the MS-DOS version, does also work for the C64 according to 64'er Special TopGames 4: During the game, the keys Shift , F , O , U , N and D need to be pressed at the same time. This gives a bonus of 10.000 $ into the town's funds. Unfortunately, the editors of the 64'er have obviously not done enough research; when testing this key combination with a crack version and the original version of the C64 nothing happened at all. They have also no effect on the X68000. However, the cheat works with other ports (MS-DOS, FM Towns, Amiga). The keys O and D do not really need to be pressed. And it all only works to a maximum amount of 90.000 $, and what is more, you release an earthquake at the fourth or fifth time. A cheat from the 64'er special no. 73: If you build a power liner over water and then set it on fire you can then plane it and you have won a bit more land for building. In the same magazine it is also advised to press F1 several times if you need money. The effect is not named in the issue but will be revealed here: You set your funds to full 4000 $. There are several cracked versions of the game, that were partially debugged. You can find over 25 cracks on the CSDb when searching for SimCity and Sim City. The version created in cooperation of the groups Wanderer and Crypt contains a trainer menu with 2 possibilities for cheating. It is also available on the Gamebase64.com - Game No. 6825. The group Synnon has also built in a trainer function (unlimited money). Unfortunately, this version has bugs. As soon as you have built yourself a small manageable town that fills your funds with a certain plus each month, you can sit back and only react to disasters. With enough endurance you can collect an enormous fortune of taxes this way. Unfortunately, there is no fast motion function in the C64 version, therefore this way to get money is inadequately elaborate. But for players that want to keep away from real cheats, worth considering. 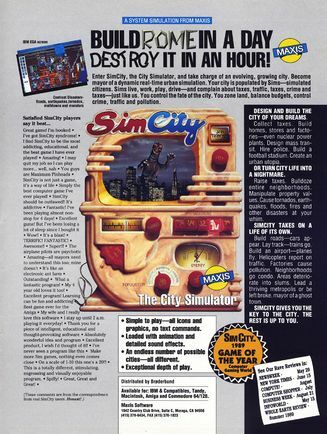 Jodigi: "Sim City is a great simulation game, but I like more the later version of the city simulator Sim City!" Shmendric: "Every couple of years the SimCity fever catches me again. I played it like crazy on PC for a long time from 1992 onwards, followed by a break until 2008. Since then, I spent many nights playing SimCity 4 and dreamed of road building designs. The first time I heard of the c64 version was mid of 2015. I tried it immediately, but not for long. No wonder, as I already knew the 16-bit versions before. 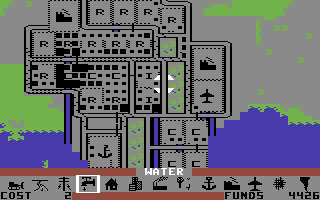 If the C64 version had been my first encounter with Sim City instead of the MS-DOS version, the cumbersome menu, the construction restrictions and the graphical shortcomings would probably not have been so annoying to me. But as it was it felt boring to me. My favorite is the FM Towns version. SimCity is a classic, no doubt. But it is not a C64 classic, rather a 16-bit classic to me." 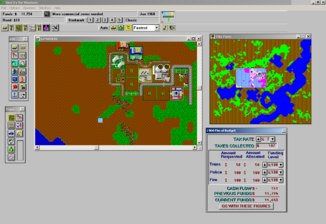 The Sim City game engine is a further development of "Wedit", the editor, which was used by Will Wright to create the game world for Raid on Bungeling Bay. The C64 version was already developed for the C64 in 1986, but published much later, in 1989. The reason was, that the publishers did not know this genre and found the possible aims in the game confusing. The publishers were still focussed in the simple principle of win or lose. As Sim City did not contain these aims, they did not want to release it. 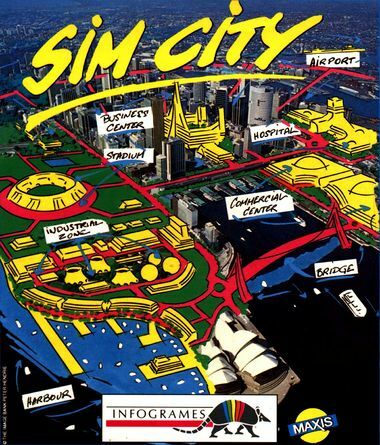 The inhabitants of Sim City are - according to the manual - called Sims . 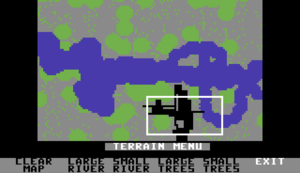 These are shonw on the start screen of the C64 version as randomly scattered points. There is an own and very successful (online) game world about the Sims since February 2000. In 2007 there was the One-Laptop-per-Child project. Electronic Arts, by now the owner of the copyright for Sim City, supported this campaign. Within this context, they announced the release of the first part of SimCity under the GPL at 12th November 2007. Thereupon was a Linux version programmed under the name Micropolis. The menu function CATALOG in the Access Disk Menu is faulty. If scores or towns are saved with a too long file name (more than 11 characters) and this menu point is instantly called up after that, then Sim City crashes. After a reset with a restart, the game works again, but the scores with a name with 11 charactes are now shown but can be loaded with the menu function LOAD. The cracker groups NEC and DOM have conjointly created a 101% version. The name 101% is for a completely debugged version. You can download the ROM at CSDb - Release No. 34549. The game was released for a big number of systems. The ports for the Amiga and MS-DOS reached the highest degree of popularity. Concerning the graphics and especially the sound, the Amiga still outmatched an average PC at that times, which also showed in the Sim City versions. The possibility in the game itself were mostly the same. On the PC Adlib sound cards were supported, if you did not have one, you had to make do with the beeping sound from the internal loud speaker. For MS-DOS the game was also released in a compilation with the game Populous. Graphically, the X68000 by Sharp only legged slightly behind the PC version, but the sound was miserable. 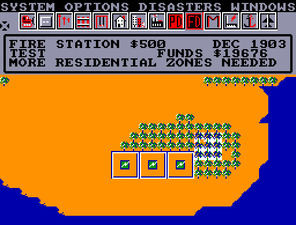 Also the FM-Towns version resembled the MS-DOS conversion strongly, but offered an excellent sound in the game. 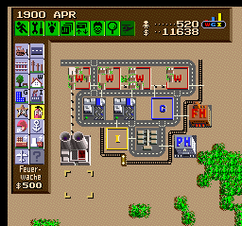 When the game Sim City was released for the Super NES three years after the first versions, Nintendo put some new buildings into the game. You get these as a bonus when you successfully manage the town. Generally, the game was presented more appropriately for children and families, which fit Nintendo's company policy. The Super Nintendo Sim City version can currently (as per 2016) also be downloaded for the Nintendo Wii. 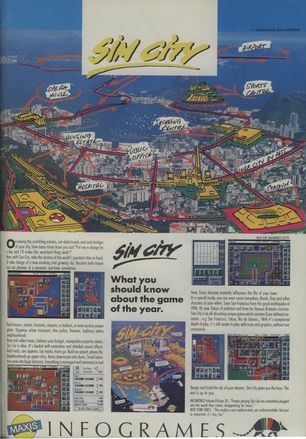 Sim City was also planned for the NES, but the project was quickly stopped again. 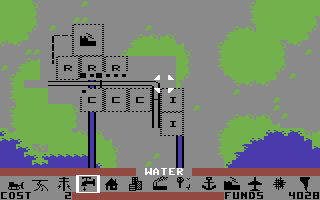 The C64 players had next to the Spectrum and CPC owners the worst graphcs and also had to fight with some bugs, but it was the only version where you could build a water system. Unfortunately, the police stations and the crime rate were deleted and the player also does not need to worry about a sufficient number of fire stations. 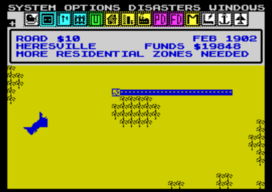 Automatic bulldozing, railway and stadiums are standard in almost all conversions, unfortunately, these features are also missing in the C64 version. 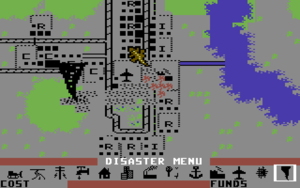 This is due to the fact, that the C64 version is the first version of Sim City. The other ports were created only years later and correspondingly gussied up. If the C64 version had been released later, Maxis would have probably made more out of the game. 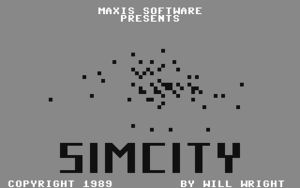 Until 2016 six sequels of Sim City were released. None of them were converted to the C64. 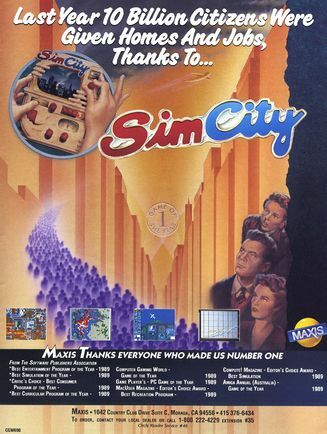 Only SimCity 2000 and SimCity 4 reached a similarly high popularity with the players as the first part of the series. 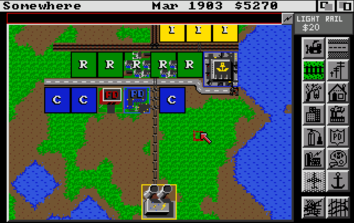 Graphics and sound were improved, the number of available buildings raised. In the sequels, the terrain was not flat, but they came up with hills. Between these two parts also SimCity 3000 was released. 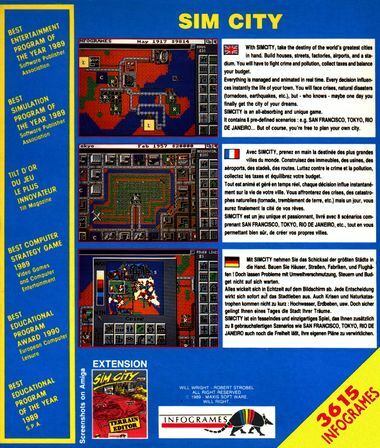 SimCity Creator, where the era also played a role, and SimCity Societies, where the focus of the game was on politics and propaganda and not on a successful economy, followed later. SimCity (2013) was advertised as a reprise of the series and therefore did not have a new number. To play, you needed a constant internet connection as the towns had an (minimal) effect on the neighbouring towns. In June 2012, the game company Electronic Arts announced SimCity Social. Later in April 2013, they proclaimed the cu-off of the project. For many of these sequels there were some addons available. The game series was financially an enormous success. 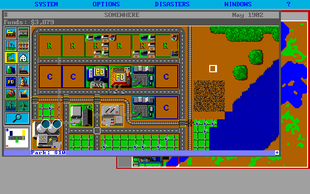 A longplay of Sim City, created by Polaventris. SimCity is a simulation without an end. A highscore does not make sense. ↑ According to the German manual "Sim.City - Der Stadtsimulator" (page 26): "Wasserwege (Waterways)"; rather a system of brooks and canals for optical reasons, local recreation and slowing down fires. ↑ Official website of "The Sims"
This page was last modified on 30 June 2018, at 19:40.